Just because Halloween is a time for scary movies, scary costumes, and scary decorations doesn't mean it needs to be a scary time for your business or job search. With The Judge Group, you can rest easy knowing there is no scary monster ready to pop out from under your company's proverbial bed. 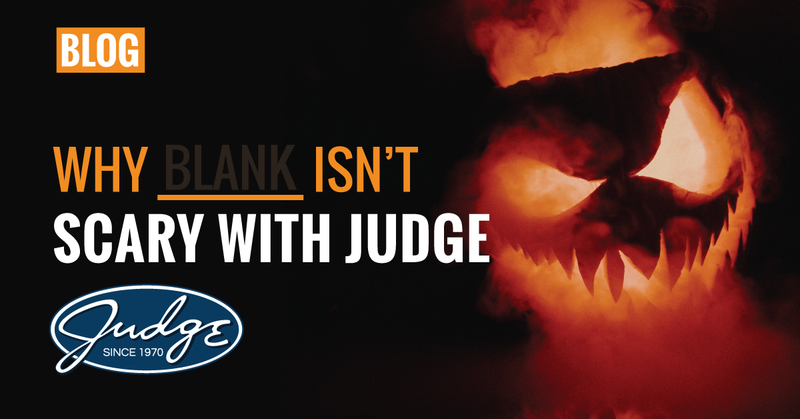 Here are a few things that aren't scary when you work with Judge. If you’ve been out of the job market for a while, jumping back in can be a little intimidating. Recruiters have a streamlined perspective that a candidate will not have stepping in. They know the current trends, obstacles, and demands of the current market to navigate you and enable you to stand out from the crowd and land that perfect position. We also know of opportunities you will not be able to find on your own! Judge’s strong relationships with our clients give our recruiters insight into what the hiring managers are looking for, setting candidates up for a successful and seamless placement. Check out some of our helpful tips for job seekers. Working with contract talent can be frightening, especially when immigration status factors in, but it doesn’t have to be. There is a lot of noise and misconception that comes with a potential contractor whose immigration status is H1B or an OPT. If you are working with the right agency then you don’t have to let that get in the way of finding the right fit. At Judge, we have worked with our clients to make sure they get the best talent whether the contractor is H1B or OPT. Have a question about hiring a H1B or OPT contractor? Reach out! We're happy to answer your questions. There’s nothing scary about working in a HEDIS role when you work with Judge! With our recruiters’ deep understanding of the industry and established relationships with some of the largest HEDIS hirers in the nation, you can rest assured you’ll be placed in a situation to succeed. Working HEDIS offers several benefits, including training, networking, and flexible position options. If you’re a HEDIS pro, or thinking about becoming one, contact us today to learn more about our opportunities and take a look at our HEDIS Hiring Season primer. Working with a recruiter can really help to calm your fears as a job seeker. True, recruiters are paid by the client and will always work towards customer satisfaction but in the end, that doesn’t happen without getting the candidate through the hiring process and onboarded as smoothly as possible. Your recruiter can offer you interview tips, client information, information on the interviewees & their tactics, perspective on the client’s needs, and, most of all, your recruiter can help you ask the difficult questions that arise in the processes. If you find a recruiter that you trust, cultivate that relationship. He or she will be a true partner for you over the course of your career. Reach out to us to get a relationship started. Creating and developing digital solutions doesn’t have to be scary. Judge Consulting embraces digital transformation inside of large organizations. We are a crucial part of teams that are looking to move from antiquated tools for their sales organizations, to deliver compelling digital tools for consumers, and to power their future, connected business. Judge isn’t afraid to work with cutting edge technologies such as wearables and machine learning to fuel the future of digital innovation. Contact us to learn more about our digital solutions. From needs analysis to implementation, we work closely with your subject matter experts and stakeholders to produce engaging eLearning solutions that meet your organizational goals. Our team adeptly conveys key messages to reinforce learning objectives and brings your content to life through rich visuals and professional voiceover. As partners in the process, we collaborate, communicate, and clarify to make your project a success. Contact Judge Learning Solutions today, and take the eek! out of creating eLearning. Cellular management can be daunting. Judge can help make the process easier. We can accomplish this by implementing our mobility cost control which reduces corporate monthly cell phone bills, while simultaneously eliminating headaches associated with managing your mobile service providers. Plus, your team is freed up to handle more mission critical tasks. Savings from our service usually ranges from 20% - 40%. Contact us to learn how your company can start saving today!